1 May 2001 On the Box again! Our Christmas Party followed the usual pattern - drink, food, entertainment and party games - but this year I thought that the food was particularly excellent, another fine example of the work of the Hereburgh Catering Crew. In November, we held our first Hereburgh Ale, inspired I think by the excellent Owlswick Ale we attended earlier in the year. We were pleased to have such a large contingent from Owlswick for this return match and we felt that we had a lot in common with their approach to the Morris. Their "Constant Navvy" party-piece was a hoot, as was Coventry Morris' "Old Men's Morris", and Kick Start amazed us with their spooky stick dance, with masks but no music. We were hoping that more sides could come to this event but, as it turned out, we had more than enough dancers and musicians to make a full and very enjoyable evening. An interesting evening out in October was the Apple Day celebrations in Eathorpe. Some enterprising villagers had organised a whole day of apple things to raise money for an ambitious new village hall - could it be that our friends, Plum Jerkum, have worn out the existing one with their weekly Border Morris practices? We danced both inside and outside the small hall and sampled cider of various types. Rosemary tried her hand at the quiz and won first prize, bringing more glory to the name of Hereburgh Morris. Chesterton Windmill was finally repaired in time for the Open Day in September but the weather was not kind to the visitors or the dancers. At least we should be able to dance beside the real thing on May 1st 2002, instead of the scale model. We haven't missed a Harbury CAMRA Beer Festival since it first started in 1991. Our arrangement with the organisers works well: we dance outside the Village Hall for an hour or so around lunchtime on Saturday in return for some beer tokens. The range of beers is always interesting and the tasting invariably produces animated discussion between dances. This year, we enjoyed the sunshine which also brought the drinkers out into the open air. The drenching we got on Saturday (at the official opening of the 2001 Sidmouth Festival, and for most of the rest of the day) didn't augur well for the traditional mass Morris stand on the Esplanade on Sunday. Five members of Hereburgh were already in Devon for various reasons but four of our colleagues were due to make a day trip to Sidmouth on the Sunday, just for that unique dancing experience. However, as luck would have it, there was miraculous change in the weather and there was sunshine and smiles all round as Hereburgh took over a prime spot on the Esplanade at 11:30. Actually, due to a misunderstanding, we took over two prime spots but met up shortly afterwards! We enjoyed dancing with Ditchling Morris before lunch and briefly with Black Bess afterwards. Lunch was, of course, a picnic on the beach (thanks to Doug and Janny for bringing enough food to feed the five thousand) and several Hereburghers took the opportunity to strip off their baldrics and bells for a dip in the sea. "You're camping? In Warwick? You must be mad!" Maybe, but there is no better way to totally appreciate and take in the atmosphere of a festival than in a tent amongst friends. As home is only a short drive away, it is possible to make sure you have nearly all the home comforts. The ground becomes harder the older you get, but with Hereburgh's own special beer tent (thanks to Doug) there was always a way to soften the ground! It was a great weekend, glorious weather, superb artists, great dancing and amazing barbecues. It was particularly good to have Lynne join us (from San Francisco) for the weekend. Not only did she join the festival but also made sure that her busy schedule in the UK included being in Harbury for the two previous practices so she was able to dance with us. I wonder how many people remember that bit in the constitution?! "Led by Rector David Brindley (who, unbeknown even to some of his own parishioners, is a member of Hereburgh) the service featured two performances by festival groups as well as a folk related sermon. The acoustics in the church are wonderful, and the performance of two numbers by the West Gallery group a real treat, but the highlight of the service for me (OK, so I'm biased) was to see David descend from the pulpit, remove his cassock (under which he sported his Hereburgh kit) and join the set for the dance Speed the Plough." Thanks to Warwick Folk Festival team for organising yet another excellent weekend. Click here to read David's thoughtful sermon. Click here to see some photographs, including the red socks. Announcement of KAPR – 24-hour Morris Dancing TV Station! I'm privileged to receive a press release from the distinguished Morris public relations consultant, Dave Shuttleworth (at present residing in San Francisco), announcing a new digital TV station dedicated to Morris Dancing. It's about time too, I hear you cry! It seems that Central Television just can't keep away from Chesterton Windmill at dawn on May Day. They were there again this year, braving the cold at 5:00am, no doubt egged on by our Karen. The difference this year was that we had to dance beside a small replica mill because the real one has still not been repaired (see earlier news stories and photos) despite all the promises we read in the local papers. Our small audience was augmented by visitors from Samois-sur-Seine, Harbury's twin village. Some of them had seen our Morris dancing before but for some, it was all new and came just a few hours after being introduced to the game of cricket. It must have been baffling! For a few days afterwards, you could even watch the video on the Net! 'It's just gone twenty past five on May 1st in the year 2001, now later today anti-capitalist demonstrators are rumoured to be storming the City of London but here just south of Leamington Spa in Warwickshire, people are marking the day in a slightly different manner. These are the Hereburgh Morris and traditionally on mayday they dance around the windmill near to the village of Harbury in Warwickshire, but this year that's being renovated, so they're dancing round a two foot high replica. For the first time in its 11 year life (as far as we know), the Harbury Windmill dance has been performed by another team. Only it wasn't in the UK - it happened a few miles away, in Golden Gate Park, San Francisco. 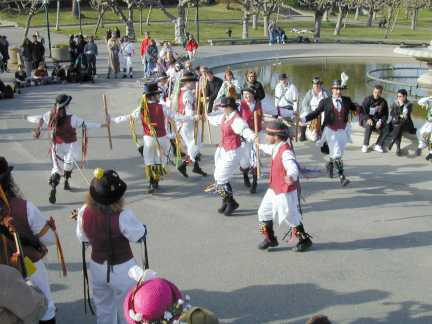 The Windmill was performed by Berkeley Morris as a show dance during the 'Ale-ien Invasion' weekend they hosted over Easter. Of course, the dance didn't just travel 6000 miles by itself - it was taken there by our very own Lynne. She tells me that Berkeley danced and played it brilliantly and she can take all the credit for that. By a strange coincidence, they already dance a Windmill dance so they have named the Harbury one as the 'Lynnemill'. It really happened. Wish we could have been there. At first sight, there's no obvious connection between Morris and Foot and Mouth. 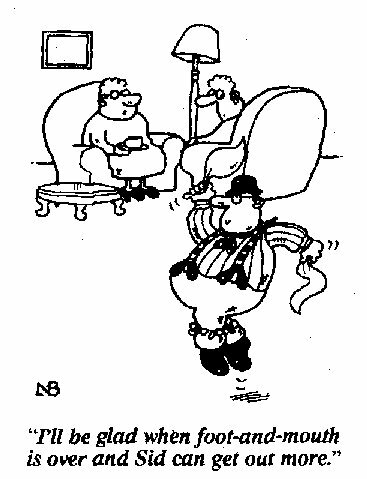 However, Celia spotted this cartoon in the paper which proves that nothing's impossible. No, this is nothing to do with the Squire's forthcoming knee operation. 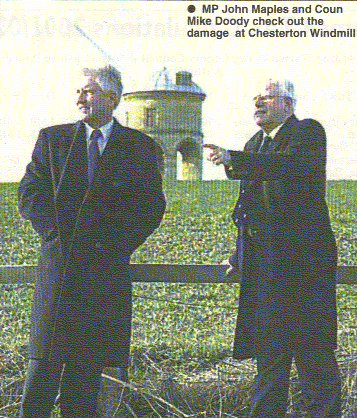 It was a headline in the Leamington Spa Courier, recording the visit of Stratford MP, John Maples, to the damaged Chesterton Windmill (see earlier news item). Councillor Doody was quoted as saying "I have asked for the work to be done before May 1, because the Harbury Morris Dancers come down to the windmill and dance round it at first light on May Day." Quite so. Another local paper, the Observer, carried a similar story, only this time the story said "It is hoped to lift the new pair of sails by crane in time for the traditional May Day Morris dance on May 1." Traditional, eh? After thirteen May Day performances at this wonderful site, we've obviously made our mark on tradition. Here is the Observer's puzzling picture. If our two suited friends are really "checking out the damage", why are they looking in completely the wrong direction? It's a bit late in the year for pantomime isn't it? Let me know if you have any good caption suggestions. Click on the small picture to reveal a larger one. We can all relax now. Celia has finally reorganised her music file using the tried and trusted alphabetic method. You know the one - start with tune titles beginning with 'A', then go on to 'B' and so on. No longer will we have to listen to her excuses about not being able to find a piece of music or claiming, in all innocence, that she was "never given a copy of that one". Me? Of course, I use the simple logic of an alphabetic filing method, although I have sub-sections for Morris tunes, Christmas carol Morris tunes, other Morris tunes, ceilidh band tunes, other session tunes, tunes that I've composed, and medleys (filed alphabetically by the name of the first tune in the medley). Simple, isn't it? All they said was, "I'll have Treacle Tart, please"! Nevertheless, the dessert menu choices they sent by e-mail to Pete J at Warwick School were cruelly rejected by the Postmaster as "potentially offensive". It didn't even seem to matter if you were a member of the clergy - the result was the same. I wish I'd thought of the headline "Vicars and Tarts"! Unfortunately I didn't, but Pete J did when he reported our reverend's e-mail experience in the school's newspaper. I suppose it's good to know that the Guardians Of Decency are alert to e-obscenities but it got me wondering about what is so offensive about that most traditional of desserts. Could it be the calorie content, the potential for smearing custard over it, or just the endless possibilities for the treacle? Please send your suggestions by e-mail to our Social Secretary but please don't mention "T...... T...". At the annual Hereburgh Workshop, on February 17, Mr Doug Freeman delivered the 2001 Hereburgh Lecture to the lunchtime audience. Doug's thought-provoking address, entitled "Morris and the Gentle Art of Fudging", had his listeners enraptured and they were visibly moved. You can read the full transcript of the lecture by clicking here. Back last September (2000), the regular Chesterton Windmill Open Day was cancelled so we couldn't do our normal dance spot there. Apparently, the mill was considered unsafe and they put a fence round it to keep the public at a safe distance. Were they being over cautious? Well, it seems they weren't because, during the winter storms that followed, two of the sails broke off, leaving the poor mill looking very sad. Of course, the really important thing is - will it be mended in time for our other regular visit - May 1st, at dawn?